Why do kids love mini food so much? Perhaps it’s because it fits in the palm of their hands and can be eaten in just one bite. Plus, it’s fun to serve it up on fancy platters to family and friends. Here are simple tips for cooking up small plates for some big fun. Have your kids write down a menu of appetizers to cook up. Try the Sesame Meatballs or Happy Hummus on kidstir.com. Look at the recipes in the Amazing Appetizers kit for more ideas. Consider making bite-size versions of other favorite foods, such as mini sliders or mini kebobs. Then round out the menu with foods to serve on party picks or toothpicks, such as cherry tomatoes, mozzarella balls, or tiny pieces of cheese. 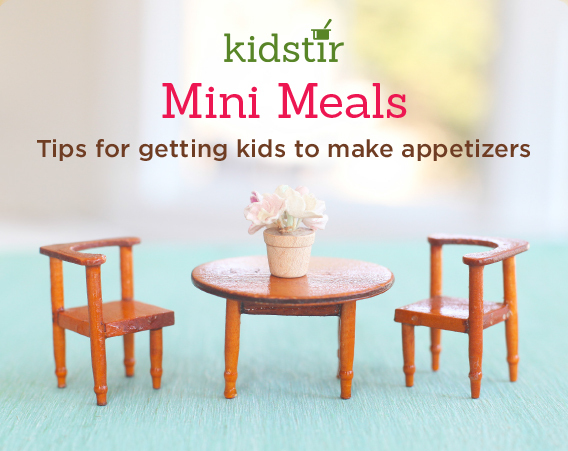 Encourage your kids to cook up their mini meal menu. They can choose one item from their menu to serve before the family dinner as an appetizer. Or, they can make three of four mini foods and cook up a complete small plate supper. Once your kids have become mini meal pros, encourage them to host a party with friends and serve finger foods. Have them line a platter with a doily for fun, and remind them to arrange the food so it looks yummy. Add some fun extras to the table like a vase of flowers, party picks, and cocktail napkins. Enjoy!